Myth # 74 Revisited: The Christmas tree tradition was brought to America by the German immigrants. This entry was posted on Sunday, December 15th, 2013 at 9:35 am and is filed under Christmas, Religion. You can follow any responses to this entry through the RSS 2.0 feed. You can leave a response, or trackback from your own site. 7 Responses to Myth # 74 Revisited: The Christmas tree tradition was brought to America by the German immigrants. As certain as the little cuckoo bird is to come flying out of that hatch door at midnight, Christmas is nearing so it’s time for another anglophile to pretend that all of our traditions can be traced directly back to England — and to the English royals, of all progenitors. Never mind that it is on the historical record that the Christmas tree tradition was brought here by Hessian mercenaries in the 1770s — many of whom permanently settled after the war — or that widespread illustration of tree decorating in America was published by a German immigrant, a Herman Bokum, in The Stranger’s Gift, long before the dates contained in the romantic yarn-spinning spoken of above. There is nothing that shouts Merry Christmas louder to Americans than letting us know we’re all still nice little cultural colonists of the good Crown. Next this titan of mythology will have us believe that, contrary to all record of fact, Halloween can actually be traced not to Irish/Scottish Celtic lore but to English folk festivals, and that the ‘real’ O Tannenbaum was first written and sung by King Conrad Weiser, England’s forgotten monarch. As certain as the little cuckoo bird is to come flying out of that hatch door at midnight, Christmas is nearing so it’s time for another anglophile to pretend that all of our traditions can be traced directly back to England — and to the English royals, of all progenitors. 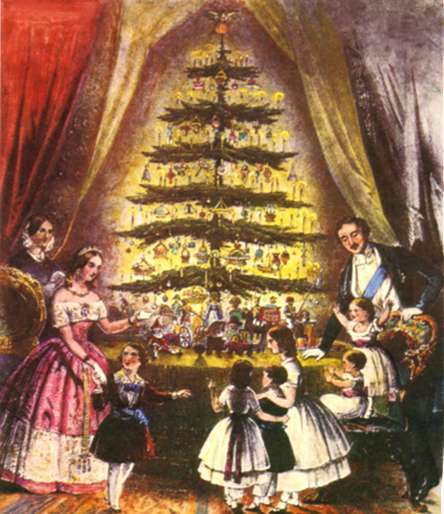 Never mind that it is on the historical record that the Christmas tree tradition was brought here by Hessian mercenaries in the 1770s — many of whom permanently settled after the war — or that the first widespread illustration of tree decorating in America was published by a German immigrant, a Herman Bokum, in The Stranger’s Gift, long before the dates contained in the romantic yarn-spinning spoken of above. There is nothing that shouts Merry Christmas louder to Americans than letting us know we’re all still nice little cultural colonists of the good Crown. Sorry for the double post. I did not see my comment and figured there may have been a ‘glitch’. No offense intended, but I must beg to differ that Charles Follen fled from the German Empire-in 1830 ‘Germany’ was still composed of semi-independent states. It was not until 1871 that Germany as a country made its appearance.